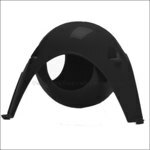 The Lounging Aisle offers a variety of accessories to provide your Rats and other critters with a safe space to sleep or lounge and feel secure and comfortable. A small flat bed made of nylon and lined in lamb wool like material. 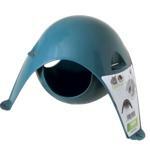 Really comfy and offers a little support around the edges, making it a perfect accessory for older rats, The edge can assist in eating and grooming. 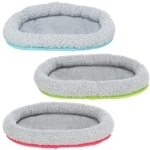 Medium size can also be used as a liner in the pawprint carrier. 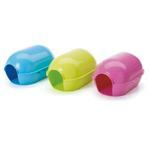 Mini size is suitable for mice, hamsters and gerbils. Azure XL Sputniks are in! You can hang it from the roof of your cage or sit it on a shelf or the floor. It will be a great addition to any cage or play area! 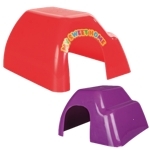 This larger version can accommodate larger pets, including larger groups of squishy rats! TIP: If your sputnik gets a little bent in the post, soak in hot water to reshape. Deep Aqua XL Sputniks are in! You can hang it from the roof of your cage or sit it on a shelf or the floor. It will be a great addition to any cage or play area! 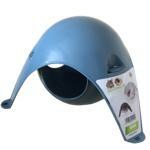 This larger version can accommodate larger pets, including larger groups of squishy rats!